The Housing Authority implemented the new policy on January 1 to protect residents from health problems created by tobacco exposure. 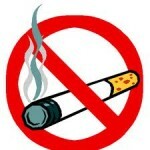 Tenants must now agree to the tobacco policy in lease agreements. The Housing Authority is a public corporation that assists low-income city residents in maintaining long-term housing. It operates the Anderson Hotel and Del Rio Terrace in San Luis Obispo, in addition to apartment complexes throughout the city. I think it’s a good idea on a couple of levels. Cigarette smoke residual can in fact affect the inside of structures by impregnating surfaces, leaving stains and odor. We as taxpayers, helping to subsidize housing should not encourage indoor smoking, as it presents a higher risk of accidental fire. In addition if one has to live in subsidized housing, should they really be spending a portion of their income on cigarettes of all things? In Europe it’s called council housing, and the homes are passed from one generation to another..
And that’s what they do here to, generation to generation. So if someone breaks the rule and smokes a cig in their own apartment, would they be kicked out?Forced into homelessness by an agency that’s supposed to fight homelessness because of a legal albiet bad habit? Or is there a process, like a warning on first offense, probation on a second offense and then eviction on a third offense. Now you realize eviction involves a court fight right. Where does state law on renters’ rights come into play? Is smoking a legal product in the sanctity of one’s home something they can be evicted over? How do they go about proving it? And what if someone already in an apartment refuses to obey this “new” rule for new people? Can this be enforced on that person? This seems to be one of those PC rules that was probably pushed by the Tobacco Control program that in effect is meaningless and leaves the Housing Authority open to potential legal entanglements. Just like the outdoor smoking bans in SLO and Morro Bay, there’s no real way to enforce this. Yeah, it’s a real problem with the obese setting their residence on fire by forgetting that their stove is on and they fall asleep on the couch …..
It’s a real problem with the smell that the obese leave in the residence due to all the food that they eat …. It’s a real problem with the damage all of their hot pots and pans leave all of those small little holes in curtains and couches and pillows and upholstered chairs and and and …. In case you did not understand my snarky remarks, smokers can cause a lot of damage; the oder of cigarette smoke can totally permeate not only every single fabric fiber (curtains, carpets, couches, chairs, pillows, towels; but even the paint and woodwork. Fire can be a real danger by a smoker drifting off to sleep with a lit cigarette, and there is all the damage from lit cigarettes placed on a surface when the smoker is not actually sucking in the toxins of the cigarettes. I would imagine that the insurance coverage for these units will go down now that smoking will not be allowed anymore; I am sorry for those who do live there now and have the terrible addiction that is smoking, but it certainly seems like this will be for the better for everyone, eventually. Will they this better than SLO PD does? Smoking is rampant downtown. Anybody know how many units there are and who or what is paying for them and what they are costing society and how many people living in these units are truly needy v. those just gaming the system? I know that people residing in the apartments pay a percentage of their income up to a maximum amount (I think it is around $500.00 a month). The biggest problem with this set up is that once you are in, you are in for life if you choose to stay. There are people living in these complexes that have been there 20/30 yrs, went to school on the tax dollars, got good jobs paying good salaries and remain in the complex for the $500 a month including trash, water, maintenance and in some cases electricity no gas. I know that SLO Housing in not full because again, clients have to pass a back ground check, drug testing, etc. So, Transitions have leased several of the apartments for their clients, Head Start uses some of the apartments and has taken over the play grounds for their programs and that SLO Housing is not really housing to assist people the way it did years ago. The Madonna Road Apts (very west end of Madonna Rd), Islay and High near their office, etc. SLO Housing Authority (George Moylan) use t really serve the people needing housing and playing by the rules. Now, all these organizations are intertwined and control the process (numbers, stats, urban areas, who’s in and who’s out if you don’t cooperate). Too much power for any one organization is just too dangerous. Did anyone catch the Head Start located at one the Housing Authority complexes (a small complex)!